David joined Washington State University originally as Project Manager for the Northwest Dryland Cereal/Legume Cropping Systems Project in 1989, one of the first USDA Sustainable Agriculture Research and Education (SARE) Projects in the West. In 1992, the CSANR was being developed internally within the College of Agriculture and Home Economics. David was offered the position of Statewide Coordinator for the Center, assumed that position in early 1993, and relocated in Wenatchee to be more centrally located to both intensive agriculture and urban/consumer constituencies. 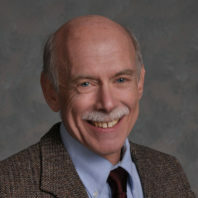 He has worked on many educational and research projects, including: introduction of polyacrylamide (PAM) for soil erosion control in furrow irrigated fields; formation of The Food Alliance and development of the stewardship program; on-farm research of biosolids and compost and the Compost Connection newsletter; integrated fruit production; soil quality studies; and the Orchard Options tour and Science and Sustainability conference. He spends a significant portion of his time in support of the expanding organic farming sector in the state and is helping to develop the BIOAg (Biologically Intensive and Organic Agriculture) program within CSANR. He is a principle investigator on the Organic Cropping Research for the Northwest grant that funds 12 different research projects in the state. And he is a principle investigator on the Climate Friendly Farming project, a 5-year multi-million dollar effort looking at how agriculture can help ameliorate greenhouse gas emissions. Prior to joining WSU, David managed an organic farm for seven years, worked in forest management, and spent a year in southern Africa with an agricultural development project. He served as on-farm research director for the Land Stewardship Project in Minnesota, where he wrote Reshaping the Bottom Line, an early sustainable ag book for farmers. He has been invited to Russia, Argentina, Chile, and Canada to conduct training in sustainable agriculture, and gives presentations on the topic across the US and beyond. David earned a B.S. degree in Environmental Conservation at Cornell University in upstate New York, his home area. He received a M.S. degree from WSU in soil management. Principle investigator on the Climate Friendly Farming project, a 5-year multi-million dollar effort looking at how agriculture can help ameliorate greenhouse gas emissions. Principle investigator on the Organic Cropping Research for the Northwest grant that funds 12 different research projects in the state. Spent a year in southern Africa with an agricultural development project. Served as on-farm research director for the Land Stewardship Project in Minnesota, where he wrote Reshaping the Bottom Line, an early sustainable ag book for farmers.